Why Does Trump Not See This, Neo-Nazi Ukraine Storm Troopers Together With "Brothers" Islamic Militants Forming A Hyper Violent Death Squad To Kill Russians ! EXCLUSIVE : Ukraine’s post-coup regime is now melding neo-Nazi storm troopers with Islamic militants called “Brothers” of the hyper-violent Islamic State stirring up a hellish “death squad” brew to kill ethnic Russians in eastern Ukraine, on Russia’s border ! So, the underlying message seems to be that it’s time for the American people and the European public to step up their financial and military support for a Ukrainian regime that has unleashed on ethnic Russians a combined force of Nazis, white supremacists and Islamic militants (considered “brothers” of the Islamic State). In a curiously upbeat account, The New York Times reports that Islamic militants have joined with Ukraine’s far-right and neo-Nazi battalions to fight ethnic Russian rebels in eastern Ukraine. It appears that no combination of violent extremists is too wretched to celebrate as long as they’re killing Russ-kies. The article by Andrew E. Kramer reports that there are now three Islamic battalions “deployed to the hottest zones,” such as around the port city of Mariupol. One of the battalions is headed by a former Chechen warlord who goes by the name “Muslim,” Kramer wrote, adding: “The Chechen commands the Sheikh Mansur group, named for an 18th-century Chechen resistance figure. It is subordinate to the nationalist Right Sector, a Ukrainian militia. 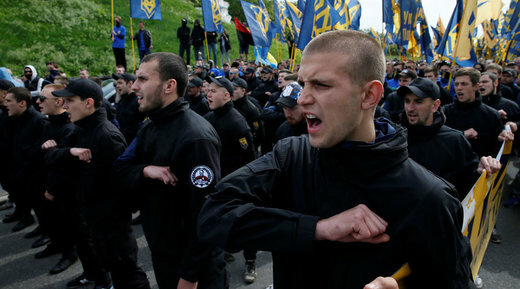 Right Sector formed during last year’s street protests in Kiev from a half-dozen fringe Ukrainian nationalist groups like White Hammer and the Trident of Stepan Bandera. “Another, the Azov group, is openly neo-Nazi, using the ‘Wolf’s Hook’ symbol associated with the [Nazi] SS. Without addressing the issue of the Nazi symbol, the Chechen said he got along well with the nationalists because, like him, they loved their homeland and hated the Russians.” As casually as Kramer acknowledges the key front-line role of neo-Nazis and white supremacists fighting for the U.S.-backed Kiev regime, his article does mark an aberration for the Times and the rest of the mainstream U.S. news media, which usually dismiss any mention of this Nazi taint as “Russian propaganda.” During the February 2014 coup that ousted elected President Viktor Yanukovych, the late fascist Stepan Bandera was one of the Ukrainian icons celebrated by the Maidan protesters. During World War II, Bandera headed the Organization of Ukrainian Nationalists-B, a radical paramilitary movement that sought to transform Ukraine into a racially pure state. At times coordinating with Adolf Hitler’s SS, OUN-B took part in the expulsion and extermination of tens of thousands of Jews and Poles. Though most of the Maidan protesters in 2013-14 appeared motivated by anger over political corruption and by a desire to join the European Union, neo-Nazis made up a significant number and spearheaded much of the violence against the police. Storm troopers from the Right Sektor and Svoboda party seized government buildings and decked them out with Nazi insignias and a Confederate battle flag, the universal symbol of white supremacy. Then, as the protests turned bloodier from Feb. 20-22, the neo-Nazis surged to the forefront. Their well-trained militias, organized in 100-man brigades called “sotins” or “the hundreds,” led the final assaults against police and forced Yanukovych and many of his officials to flee for their lives. In the days after the coup, as the neo-Nazi militias effectively controlled the government, European and U.S. diplomats scrambled to help the shaken parliament put together the semblance of a respectable regime, although four ministries, including national security, were awarded to the right-wing extremists in recognition of their crucial role in ousting Yanukovych. At that point, virtually the entire U.S. news media put on blinders about the neo-Nazi role, all the better to sell the coup to the American public as an inspirational story of reform-minded “freedom fighters” standing up to “Russian aggression.” The U.S. media delicately stepped around the neo-Nazi reality by keeping out relevant context, such as the background of national security chief Andriy Parubiy, who founded the Social-National Party of Ukraine in 1991, blending radical Ukrainian nationalism with neo-Nazi symbols. Parubiy was commandant of the Maidan’s “self-defense forces.” Barbarians at the Gate At times, the mainstream media’s black-out of the brown shirts was almost comical. Last February, almost a year after the coup, a New York Times article about the government’s defenders of Mariupol hailed the crucial role played by the Azov battalion but managed to avoid noting its well-documented Nazi connections. That article by Rick Lyman presented the situation in Mariupol as if the advance by ethnic Russian rebels amounted to the barbarians at the gate while the inhabitants were being bravely defended by the forces of civilization, the Azov battalion. In such an inspirational context, it presumably wasn’t considered appropriate to mention the Swastikas and SS markings. Now, the Kiev regime has added to those “forces of civilization” — resisting the Russ-kie barbarians — Islamic militants with ties to terrorism. Last September, Marcin Mamon, a reporter for the Intercept, reached a vanguard group of these Islamic fighters in Ukraine through the help of his “contact in Turkey with the Islamic State [who] had told me his ‘brothers’ were in Ukraine, and I could trust them.” The new Times article avoids delving into the terrorist connections of these Islamist fighters. But Kramer does bluntly acknowledge the Nazi truth about the Azov fighters. He also notes that American military advisers in Ukraine “are specifically prohibited from giving instruction to members of the Azov group.” While the U.S. advisers are under orders to keep their distance from the neo-Nazis, the Kiev regime is quite open about its approval of the central military role played by these extremists whether neo-Nazis, white supremacists or Islamic militants. These extremists are considered very aggressive and effective in killing ethnic Russians. The regime has shown little concern about widespread reports of “death squad” operations targeting suspected pro-Russian sympathizers in government-controlled towns. But such human rights violations should come as no surprise given the Nazi heritage of these units and the connection of the Islamic militants to hyper-violent terrorist movements in the Middle East. But the Times treats this lethal mixture of neo-Nazis and Islamic extremists as a good thing. After all, they are targeting opponents of the “white-hatted” Kiev regime, while the ethnic Russian rebels and the Russian government wear the “black hats.” As an example of that tone, Kramer wrote: “Even for Ukrainians hardened by more than a year of war here against Russian-backed separatists, the appearance of Islamic combatants, mostly Chechens, in towns near the front lines comes as something of a surprise, and for many of the Ukrainians, a welcome one. Anticipating an attack in the coming months, the Ukrainians are happy for all the help they can get.” So, the underlying message seems to be that it’s time for the American people and the European public to step up their financial and military support for a Ukrainian regime that has unleashed on ethnic Russians a combined force of Nazis, white supremacists and Islamic militants (considered “brothers” of the Islamic State). By Robert Parry Investigative reporter Robert Parry broke many of the Iran-Contra stories for The Associated Press and Newsweek in the 1980s.